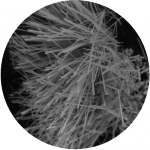 Petrographic Analysis | Our Tools | DRP Consulting, Inc.
DRP uses advanced equipment and techniques for the preparation of samples for both optical and electron microscopy. Stereomicroscopic examinations of polished slabs allow for detailed examination of the full thickness of a construction element. Petrographic thin sections facilitate studies of paste microstructure and secondary reaction mechanisms such as sulfate attack and alkali-silica reaction. Good things come in small packages. This little wafer is the backscatter electron detector for the scanning electron microscope. The electron microscope is a powerful tool for characterizing raw materials, such as this fly ash particle. 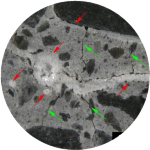 The most important tool in petrography is understanding how to relate microstructural observations to the performance of the material in the larger structure. We made a deliberate choice to focus on our energy on what we do best: petrographic analysis. We use state-of-the-art equipment and techniques to unlock the microstructure of construction materials. Optical microscopes serve as the cornerstone of our practice. See how we shed light on understanding the nature of construction materials. 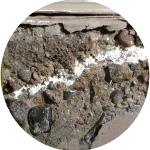 Our background in geological field work, which hinges on the compass, offers a seamless translation to investigating concrete in the field.